A full spectrum blend of these two powerful extracts has been crafted for us, amplifying each plant more than might be expected. 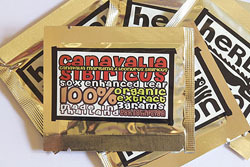 IMPORTANT NOTE: If you choose to smoke these natural herbal products, be advised that you do so at your own risk. Any form of smoke inhalation may be physically harmful. All descriptions of the traditional uses of these herbal smoke have been taken from information available to the public and do not constitute the personal opinions or SweetSmoke Herbs. Furthermore, none of the herbal blends and herbal extracts are intended to be legal alternatives to any legal medicines, illegal drugs, or otherwise. They are not intended to mimic any effects of any of the above and, are intended to be enjoyed for their own 100% legal herbal properties. Please see our DISCLAIMER for specific details.